Choreography by guests Jawole Willa Jo Zollar and Jennifer Harge, and faculty Bill DeYoung and Robin Wilson. 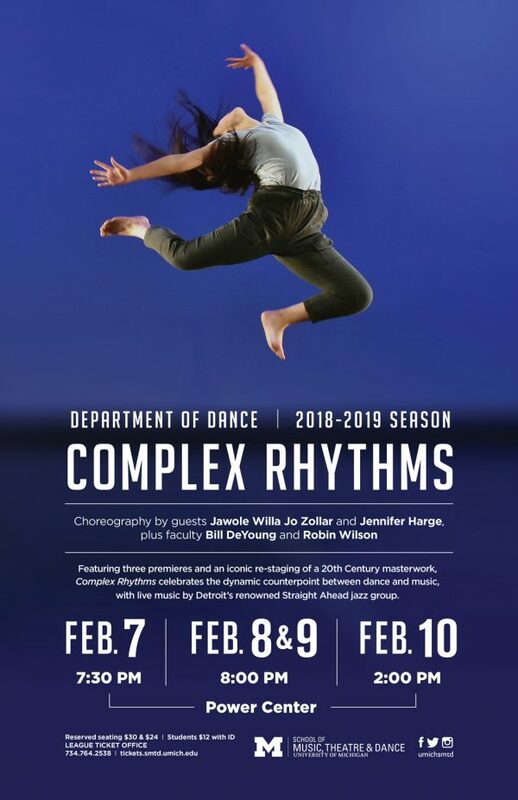 The Department of Dance’s annual concert, Complex Rhythms, features the re-staging of a noted twentieth-century masterpiece and three new creations. Shelter, created in 1988 by Urban Bush Women founder Jawole Willa Jo Zollar, is an unsentimental commentary about homelessness and disenfranchisement. The New York Times wrote, “[Shelter] is so filled with compassion and anger that it becomes a powerful incantation against the evils of obliviousness and neglect.” Alumna Jennifer Harge, artistic director of Detroit’s Harge Dance Stories, is a performer who uses the body to tell stories. She was recently honored as a Visual Arts Fellow by Kresge Arts in Detroit. Harge’s work lies at the intersection of movement, performance art, African-American culture, and choreographies of protest. In celebration of Leonard Bernstein’s centenary, faculty member Bill DeYoung sets a new work to Bernstein’s Prelude, Fugue, and Riffs (1955). Robin Wilson will create a new work inspired by her upcoming trip to Cuba in May.